Excerpt: “But – here we go. I am increasingly troubled at the inconsistencies in the official narrative of 9/11. It’s not just the obvious non sequiturs: where are the aircraft parts (engines, etc) from the attack on the Pentagon? Why have the officials involved in the United 93 flight (which crashed in Pennsylvania) been muzzled? Why did flight 93’s debris spread over miles when it was supposed to have crashed in one piece in a field? Again, I’m not talking about the crazed “research” of David Icke’s Alice in Wonderland and the World Trade Center Disaster – which should send any sane man back to reading the telephone directory. As expected, Fisk responded with vigor although he never answered my question because he never heard it. If you listen closely, you’ll hear that before my question is even stated, Fisk latches on to his favorite 9-11 meme and doesn’t hear me. He steamrolls my question and answers as if I had asked, “Did George Bush “do” 9-11?” I asked nothing of the sort (I asked about middle eastern perception of 9-11 events) but my question got almost instantly transformed into a product of his imagination. In this regard Fisk is like almost everyone else! The Swill Bucket intends to post the entire event. Stay tuned. The Swill Bucket welcomes visitors referred by Project Censored. I apologize for the circuitous route to the story, “Over 1000 architects and engineers have signed petition to reinvestigate 9-11 destruction,” which is part of story #14, “Increased Tensions with Unresolved 9-11 Issues” in this year’s Censored 2011. The story was originally written as a script for KPFA radio, which aired the story on February 21, 2010. I posted a print version of the story on Examiner.com shortly thereafter, which is the version picked up by Project Censored. Recently, for whatever reason, I lost access to this story (it vanished from my publishing tool) and could not get a straight answer from Examiner explaining why. I have subsequently severed my ties to Examiner.com. Architects and Engineers for 9-11 Truth founder, Richard Gage, AIA, began the conference quoting Mark Twain who said, “If you don’t read the newspapers you’re uninformed. If you do read them you’re misinformed.” Gage said he hoped the assembled press would help to rectify that statement. 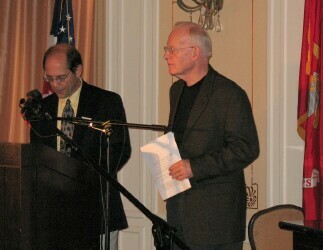 “Today I’m quite pleased to announce that now we have more than one thousand architects and engineers signed on to the A&E911Truth petition demanding of Congress a new and truly independent, unimpeachable investigation into the destruction of the three World Trade Center skyscrapers on 9-11,” Gage said to a cheering audience. Numerous architects and engineers spontaneously spoke during the event about what had led to their decision to get involved in a movement that could potentially jeopardize their careers. Most agreed that it was the suspicious collapse of World Trade Center Building 7 that first caught their attention. No airplane hit the building and the fires were small. Gage said the fires were unlikely to have disabled the supporting columns all at once in order to quickly and neatly drop the skyscraper. For a hundred feet the building fell at freefall speed. There was also evidence of foreknowledge regarding World Trade Center 7’s destruction. The BBC reported live that it had fallen twenty minutes before it actually fell; viewers could see the building standing in the background. Physics professor Dr. Steven Jones along with an international team of scientists, analyzed World Trade Center dust from several sources and claims they found unmistakable traces of nanothermitic composite material–explosives that could be used to demolish the three skyscrapers. He and other architects and engineers say this explains the pools of molten metal found at ground zero weeks after the incident. Jones co-authored a peer-reviewed paper on the subject which led to his being fired from a tenured faculty position at Brigham Young University. As Professor David Ray Griffin and others have pointed out, this paper is receiving a great deal of attention in Europe. the group hopes that it will receive more media attention in the United States as well. 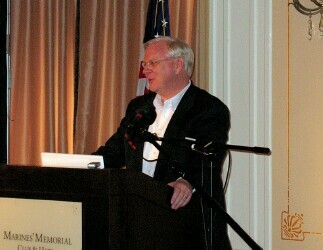 Griffin spoke at the conference. 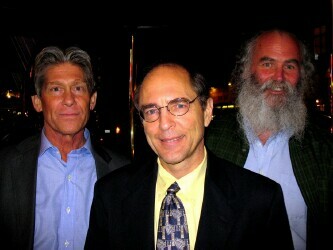 Although not an architect or engineer, he is considered one of the most respected members of the 9-11 Truth Movement. I asked Griffin why media outlets–even alternative ones–are typically so reluctant to even look at the 9-11 evidence. The KPFA Radio version of this story may be found here. Nine minutes, eleven seconds into broadcast; anchor’s intro begins shortly thereafter). Hear Richard Gage commenting on the success of the day’s events. The full video of the event may be found here. Press Conference Question and Answer Session. Press conference luncheon. Press conference epilogue.